Following the series of baby mama dramas that has rocked the boat of Wizkid, the singer has come out to make a reaction. 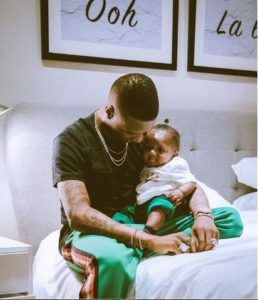 Still fresh in the news are the veiled allegations against Wizkid by his first two baby mamas who seem to suggest that the singer has not been the caring and supportive father he appears to be in public. Supposedly reacting to these allegations, Jada Pollock, Wizkid’s third baby mama and manager, put up a post on Instagram, sharing her own experience as the mother of Wizkid’s son, Zion. In her post she appreciated the singer for being a great father to their child, contradicting the claims of baby mama 1 & 2 in Wizkid’s life. Reacting to Jada’s post, Wizkid wrote ‘2 side to every story’, suggesting that the claims by Sola and Binta (Wizkid’s first two baby mamas) should not be taken as the full story.